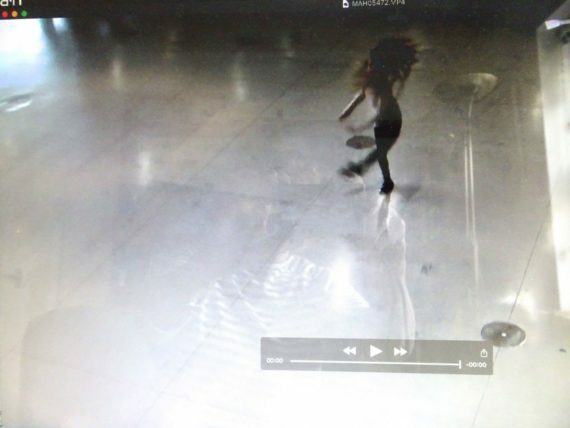 So after deciding to live firmly in the moment, I’m experimenting with a short video I took in Paris when my lovely grand-daughter suddenly flew into action in the middle of the Pompidou Centre in Paris. She’s a very talented ballet student and although dressed in denim shorts, thick black tights and Doc Martin-type boots she couldn’t resist the shiny empty floor. I was watching from a balcony above and managed to catch 16 seconds of her dance. So far I can’t edit the footage or transfer it to iplayer so will have to get someone to help. Here’s a shot I took of the screen…her long hair flying everywhere. For her classes she has to scrape it back into a tight bun ! Reading about Hodgkin’s search for his visual language made me consider my own visual language. Having made the leap into a more abstract style of painting I now wonder if it matters that I still draw in a quite figurative way. I’d like to do some figurative drawings of Kate dancing and just of her face perhaps in a careful portrait. Alongside that, or even on top of these, I could display the video hopefully slowed down. I could also make some Impressionistic/Abstract Expressionist paintings of the dance scene in Paris working from my memory. 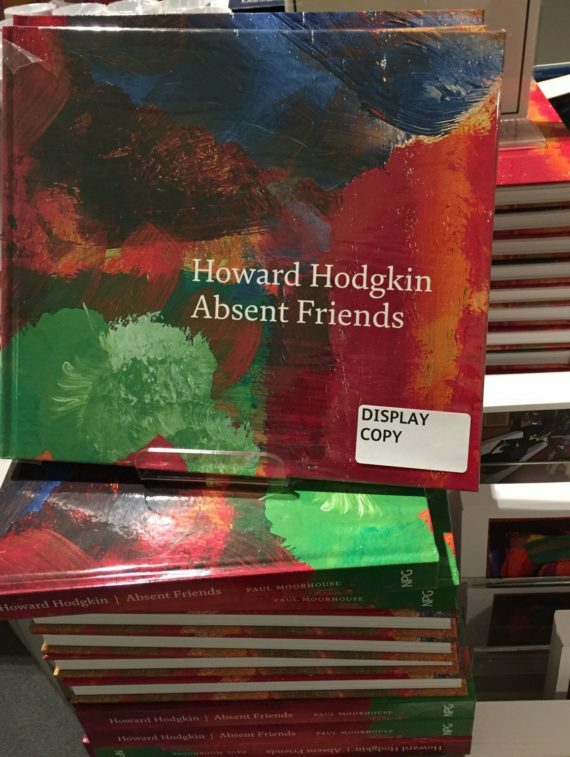 Hodgkin said his work was about the memory of the feelings and emotions experienced at an event. With the combination of these three methods I might be able to evoke the essence of Kate. Hodgkin says that form and colour are equivalents for physiological representation. I like that. What’s more, I think I understand it! Similarly, as Hockney has said, it is impossible to accurately capture reality as our eyes are constantly moving and changing focus and direction so reality is shifting, second by second, making it impossible to pin down an image. What the artist must do is to capture the essence of reality as he/she sees it. It’s then up to the viewer to add their own reactions to an image which then gives reality yet another dimension. Sounds sort of logical but can I do it? 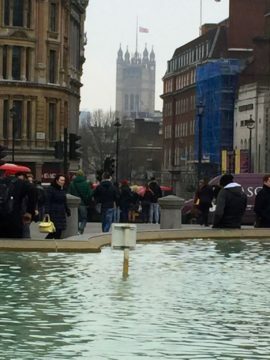 Today of all days was a good day to visit London. Out of the shock and horror of events on Wednesday emerged a palpable sense of solidarity, caring, love and hope. Walking through Trafalgar Square after my visit to the National and the Portrait Galleries I felt very close to tears. The atmosphere was so calm and everyone seemed to radiate confidence and kindness. 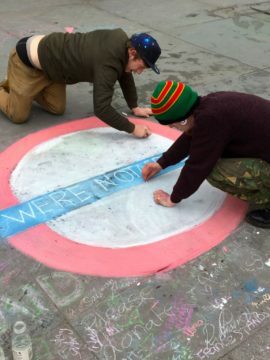 Londoners refuse to be intimidated by the terrorists and were quietly carrying on with life….very moving. The Howard Hodgkin exhibition at the Portrait gallery was popping with colour. Contrary to my expectations there was so much to learn about his thoughts on his work. Previously I had gleaned the impression that he often refused to explain or discuss his work but thanks to superb curation the theories behind his acclaimed figurative portraits were clear and concise. Metaphors for objects, locations and people became visible. I had to buy the book in order to research further into this. I’m sure it will be of such value to my struggles with my MA studies. And thereby hangs another tale. Apologies to anyone who read my blog about my ‘new painting’ but it’s now abandoned/painted over already. I’ve been increasingly stressed about the subject of my work lately and after a tutorial at UOS followed by some wise conversations with my husband, I acknowledged that dwelling on the past… a difficult relationship with my mother and the sadness at the death of my brother was really getting to me. It’s easy to think you’ve moved on from damaging emotions but sometimes they run so deep that you’re not even aware that they are still adversely affecting your outlook. I’ve got to let them go and find another way. I believe that delving deeper into the rationale of Hodgkins approach to portraiture will help to lay some ghosts and to push my practice forward…not to mention the difficult Reflective Journal I have to write in tandem with painting practice! So ….the painting of Dorset is on hold. I’m still going down there to paint in April but it’s such a beautiful location that I will find another angle to interpret. I must look to the future, or at least,live in the moment. Just begun a new painting about a childhood memory of holidays in Portland, Dorset. 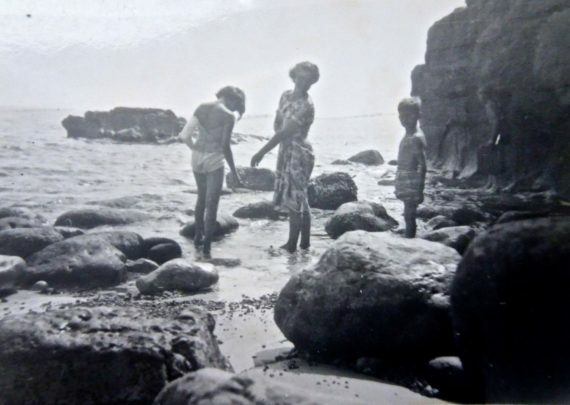 I found a tiny black and white photo of myself, my brother and mum at a place called Church Ope Cove in Dorset. I remember so clearly paddling that day at the beautiful spot. My arm is in plaster so I couldn’t swim. It’s a very bad photo and so I copied it to the computer and slightly improved the definition. Weirdly , you can see through the figure of my brother, the faint outlines of the rocks. It’s almost as though he’s transparent. Quite disturbing as he’s now dead. He’s also hanging back as if a little afraid of the water. I actually wanted to capture the poignancy of the image as it is slightly sad remembering the pleasure of that holiday so long ago. So the transparency of his figure might be a useful thing to include. 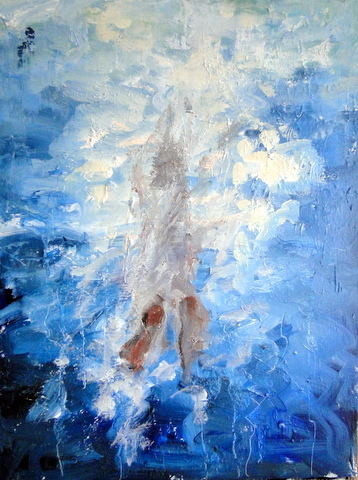 As usual I began quite figuratively but intend to abstract the image slowly. I think it has more power to arrest the viewers attention and make them think and put their own interpretation on the image. I’m also planning to stay at Portland in April for 4 days to paint the actual place as I don’t like working from photos. It will be interesting to do that alongside my ‘memory’ painting. I’m thinking this might be the start of a series about the coast which I can use for my final MA module. I had a fascinating day yesterday. A Uni visit to the Sainsbury Centre – what a fantastic building by Norman Foster ! But to stay on the point…. we had a most informative session with Alex and Kimberley looking at ‘the art object’ and collections within the gallery with reference to how they should be displayed and how viewers interact with objects and art in general. The clever way we were asked to introduce each other was through choosing an object, seemingly at random, and then talking about it as we said our names to the group. This was just the start of illuminating thoughts on how we connect with the world. The whole visit lasted for 3 + hours and was interactive, surprising and thought-provoking. All within wonderful surroundings. 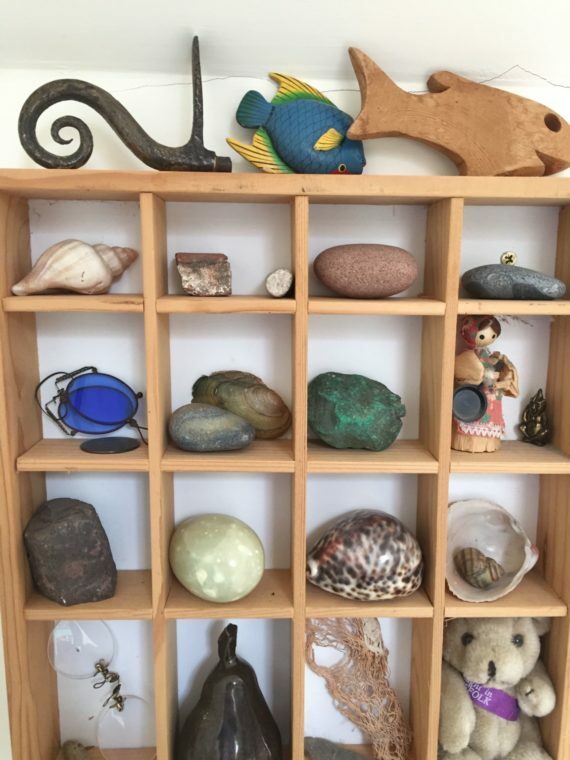 It prompted me to look with new interest at my own small collection of objects. Each one has a special meaning and significance for me. 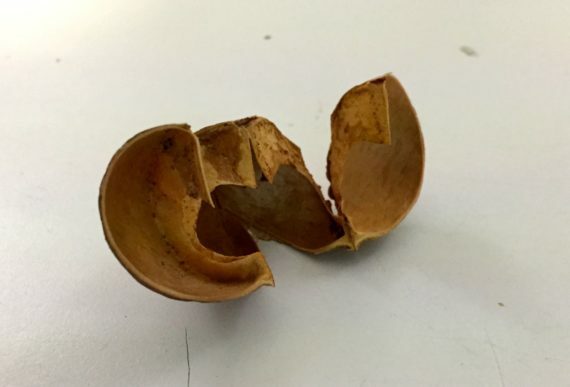 The importance we place on inanimate objects can be quite revealing and lead to questions about hierarchy and meaning….but that’s another whole new blog. 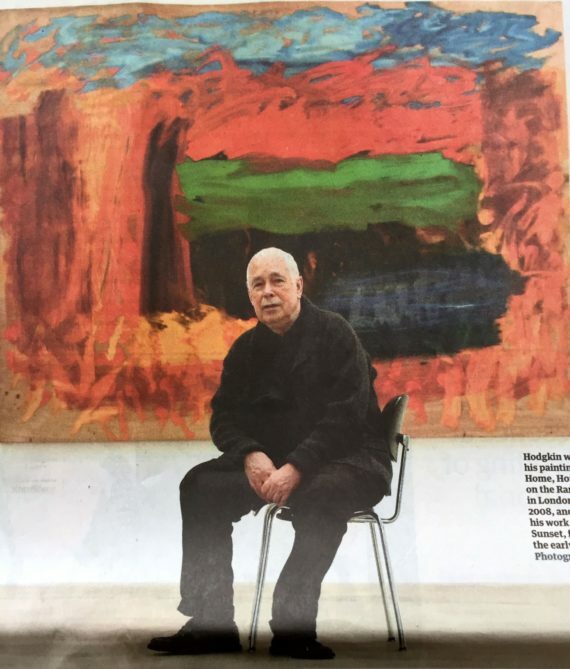 Today I awoke to hear that Howard Hodgkin had died and the papers are full of reviews and obituaries. Only recently I rediscoveredHis work and blogged about it back in December 28. Since then I have been looking at his work and articles written about his painting. I found that many of his ideas concur with my own. In fact I’m coming to the conclusion that most, if not all, painters arrive at quite similar views. There’s really only one universal subject or aim and that is to reflect on the world in which we live. It’s all a vast commentary on life itself. He insisted that his work was figurative although to the untrained eye it certainly looked abstract. The term abstract can be confusing. Much art is abstracted rather than abstract. It has been one of my ongoing struggles to decide if my own work is figurative/impressionistic/abstract expressionistic or some sort of hybrid mixture? The millions of different interpretations of the subject are what makes it so fascinating, never-ending, frustrating and elusive. But thank goodness for the endless challenge. I look forward to the forthcoming exhibition of Hodgkins work at the National Portrait Gallery which now will no doubt be a must-see show. 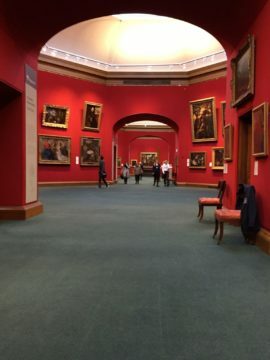 As well as a visit to the Gallery of Modern Art in Edinburgh, I popped in to the National Gallery to see the Degree show of newly qualified artists from Dundee, Glasgow, Aberdeen and the Highlands & Islands. I was delighted to see so much painting there. I asked if I could take photos as there was some exciting and original stuff on view. I was almost disappointed to be told, YES I could. I really dislike the fact that art galleries are these days, full of people taking ‘selfies’ in front of beautiful works of art. It seems such a crass thing to do. But, as I was told, it’s hard to prevent it. As long as such images are not exploited on facebook etc. it’s OK and in this case, I simply wanted to remember what I’d seen. So I’m compromising and here are a couple of shots of the lovely interior of the gallery. Plus, I must mention the names of three promising painters whose work I admired….Sam Drake, Emily Stewart, Felix Carr. 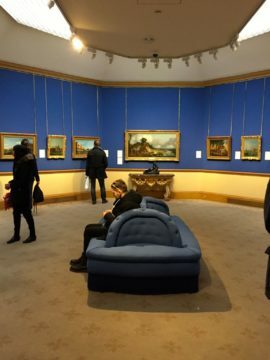 These in particular caught my attention but generally there was much to be admired and some extremely innovative work in every room of the extensive show. It closes on March 15 so if anyone has got time and are in the area it’s well worth a visit.